"American Idol" made its big return Wednesday night with some the expected feuds between new judges Mariah Carey and Nicki Minaj -- and a new series of contenders, hoping to make it through auditions. The pop divas exchanged insults worthy of middle schoolers, fellow freshman judge Keith Urban looked trapped between them, and there was a whiff of make-believe Wednesday about the show's touted feud. "We can have accessories. I didn't know that was allowed. That's all I'm gonna say," Carey commented archly about Minaj's flashy, drum major-style hat. "Why'd you have to reference my hat?" Minaj said, with Carey then accusing Minaj of rudeness to her during an earlier elevator meeting. Mercifully, a contestant arrived to break up the bickering and remind us that we tuned in to a talent show, not an episode of "Real Housewives of American Idol." When the action resumed, Minaj demonstrated a magnificent talent for eye-rolling and upped the ante with a muttered insult. "If she called me something that begins with a 'b' and ends with an `itch,' I rebuke it," Carey declared. Whether the clash is real or not, Minaj's scrappiness came off as far more entertaining than Carey's demure, even queenly manner. Carey is getting a truly royal paycheck: $18 million, to Minaj's $12 million. The award for least self-absorbed judge goes to genial country singer Urban. The two-hour episode opened by showcasing last year's winner, Phillip Phillips, and those alumni with established careers, including Carrie Underwood, Kelly Clarkson and Jennifer Hudson. 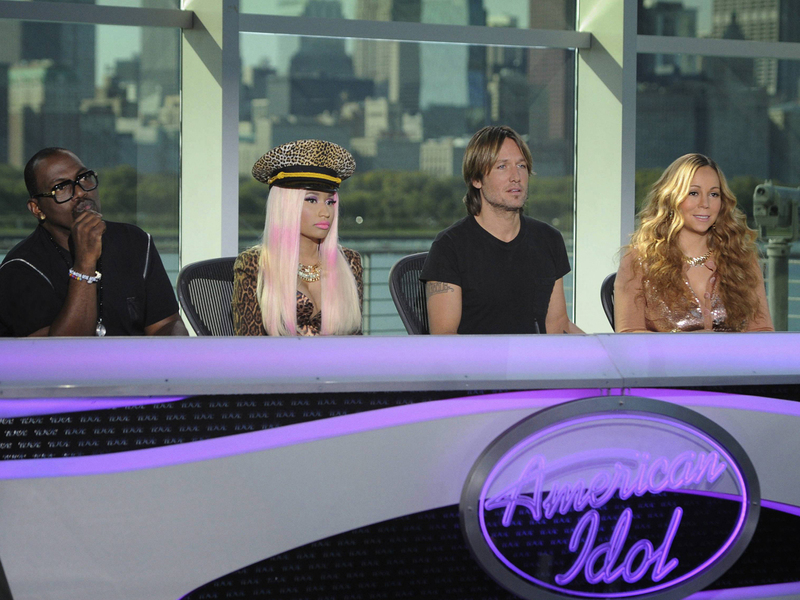 Then host Ryan Seacrest brought "American Idol" back down to earth and to its new judges. "Our legacy continues as a new era begins," he said, reciting the panelists' resumes, including record sales, Grammys won and, in Carey's case, vocal range (five octaves, "the definition of diva," Seacrest said). Cue the parade of good, bad and touching performances and biographies, with contestants facing serious challenges once again an "Idol" hallmark. The judges, including veteran Randy Jackson, hardened their hearts and rejected a young man who had lost a leg to cancer but melted for a teenage girl whose family fosters children with medical concerns and another singer with partial hearing loss. Forty-one people survived the New York auditions to sing another day in the Hollywood rounds, with the action moving to Chicago on Thursday's episode. Among the survivors was Anna Torres, who won over the judges with her version of Carole King's "You've Got a Friend." "I feel like we jell well in a weird, crazy way," Minaj declared optimistically of the panel near the episode's conclusion. Fox certainly hopes so. Last season, "Idol" lost its status as the most-watched TV program for the first time since 2003, eclipsed by NBC's "Sunday Night Football," and pegged its lowest-rated season since it debuted in summer 2002. "American Idol" returns on Thursday at 8 p.m. ET on Fox for a follow-up one-hour episode that will follow Chicago auditions.